Explore o paraíso acidentado de Kauai em um passeio de jipe privado de 5 horas. Aventure-se fora do caminho batido para experimentar praias deslumbrantes, cascatas e vistas fantásticas da montanha, incluindo a borda do majestoso Waimea Canyon. Veja o esguicho do Chifre Alto, nade na Praia de Poipu e opte por um piquenique na praia. Um motorista e guia local amigável pode personalizar o itinerário para atender às suas preferências para uma aventura inesquecível na ilha. Visite Waimea Canyon, conhecido como o "Grand Canyon do Pacífico"
Kauai Jeep Tours is simply amazing !!! Unforgettable! This is a Tour you can’t miss. Our guide Simon was excellent !!! He shared a lot of information on traditions, history and major events related to the different sites we visited. We will never thank you enough! We thoroughly enjoyed our Kauai Jeep tour. Simon was a great tour guide. We were glad we did this tour at the beginning of our trip as it gave us a great overview of the island. Simon gave us tips and ideas about where to go and when. We especially enjoyed the Waimea Canyon section of the tour. Simon knew where to pull over for the best views and he was very knowledgeable about the area. Had a great time scoping out the island with DJ as our guide. First we checked out the Spouting Horn before heading up to see the beautiful Waimea canyon and Waipo'o Falls. Stopped at a number of strategic points at various elevations for scenic views and pictures. Ultimately we made it up to Pu'u O Kila Lookout to see the stunning and incomparable look down into the Kalalau Valley to the Napali coast - fortunately, even the weather was cooperative. My husband and I booked our honeymoon in Hawaii, with Kauai as our last stop. 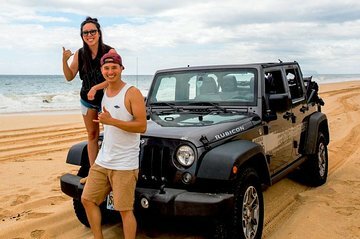 We were looking to do more relaxed activities as our honeymoon wound down, and our Kauai Jeep Tour hit the right notes for us. Our tour guide, Simon, went at just the right pace and brought us to a lot of picturesque lookout points along the road, going from our hotel in the southeast part of Kauai all the way to the warmer and less populated west. We saw a beautiful view of the Waimea Canyon, the Polihale beach, a sea turtle and a monk seal sunning themselves on the beach, and even a deer, which Simon mentioned is a very rare sight on the island even he hadnt seen one in person. Throughout the trip, Simon was very chill and knowledgeable, going at a pace that was just right for us, and giving us options for what sights to see and which ones to skip, depending on our preference. During one of our stops, he also picked some fresh fruit for us different types of guava, which tasted great. We also stopped at Kauai Coffee Company, which I recommend you do if youre a coffee lover their Typica roast was my husband's favorite. That was a good suggestion by Simon and not in the brochure, so we appreciated it. Overall we definitely enjoyed the tour and were grateful for the atmosphere Simon fostered for us. Sometimes on vacation its easy to get lost in the rush of things, so a nice relaxed tour is just what we were looking for. Thanks! It was a great trip ! Simon and D.J. were outstanding as they gave us an inside look at the most beautiful spots in Kauai. They took the time to stop at so many different areas and get out and let us walk to get even better photos. They even stopped in town to let us sample some great coconut shrimp for lunch at a place only insiders would know about, not a tourist trap. Along the way, they gave us a running commentary about the island and it's wonders. Just a great personal tour ! This was a great tour that we got to customize to what we wanted to see!. Our tour guide Simon was great! The Jeep tour has been our fav tour so far, we seen parts of Kauai that we def would not have seen otherwise AND....drumroll please!!! We seen a munk seal sunning himself in the sand and the most incredible double rainbow imaginable. Just when I thought I had experienced all of the beauty of this incredible island, there was that . Our guide, David was the best host, a local boy that was very personable and very knowledgeable about everything we threw at him. Ask for him when you book the tour! !